In the beginning of my Spa journey, after taking training in Oakland, California and Santa Fe, New Mexico I needed a skin care line to complement my body treatments which focused on European products from the Dead Sea, Moor in Austria and the sea weed off the shores of Britany. 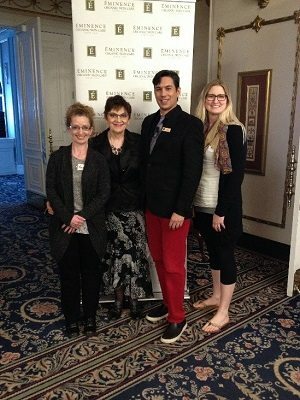 I travelled to Spa Conferences in Banff, Vegas and Vancouver. 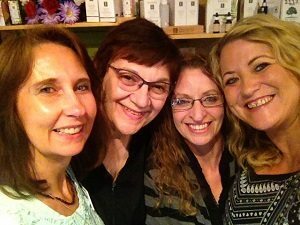 Sunrise Wellness Spa was the second spa to bring in Eminence Organic Skin Care into Saskatchewan. Geraldine is in the forefront of this amazing product that is made from Pure Fruits and Vegetables; cold pressed – so as not to disturb the effectiveness of the product. Made in a controlled environment in small batches to preserve the quality. No water is added to the product so all products contain 98% active ingredients. Eminence sent two of their trainers to help launch Eminence into Unity in March of 2007. JoLynn Desjarlais (my first regional representative) brought two of her helpers and braved our Saskatchewan winter weather to be here to show Eminence to Unity residents. Geraldine brought in the full line of Eminence. Training was readily available for myself and my staff Lucy Koenig, Stacia Ramsay and Stefanie Rehauser. Geraldine took all of her staff to Regional Training to have firsthand training from the Best of the Best. Vancouver, ESI yearly Spa Show and conference to get the latest training Boldijarre had to offer about new products. Christel Salamon from Churchbridge is our current regional representative and comes to train us and bring us up to date with all that Eminence has to offer in products and incentives. Through our Forest for the Future initiative we help over 284 families in Kongheul, Senegal grow sustainable Forest Garden Projects. Through our Forest for the Future initiative we help over 284 families in Kongheul, Senegal grow sustainable Forest Garden Projects. Through these projects, participating farmers overcome issues that are common in their communities, grow trees to feed their families, create sustainable incomes and nurture the earth. Our Forests for the Future Program, in partnership with the non-profit organization Trees for the Future, helps train farmers in developing countries around the world on how to build productive and sustainable Forest Gardens. Every tree we plant enables the development of these Forest Gardens in rural communities, empowering local people to restore their environment, grow their own food and build a sustainable income and future for themselves, their families and their communities. Since 201 3, the Éminence Kids Foundation has donated organic fruits, vegetables and juices to sick children around the world. 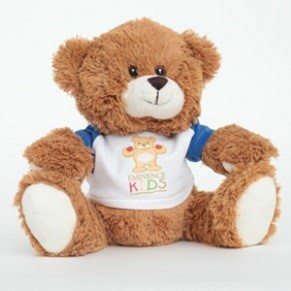 Today, we’re proud to announce the next steps in our journey: a beautiful new website and a name for our teddy bear mascot. health. With the launch of our new website, we can now provide more information as well as accept online donations for the Foundation. We are excited to advance this important cause through this new destination online. The Éminence Kids Foundation, founded by company owners Boldijarre and Attila Koronczay, shares the same beliefs in its mission to donate organic fruit, vegetables and juices to sick children around the world. Not only does the Foundation help children through their recovery, it also educates them about the importance of healthy, organic nutrition as an essential part of their treatment. Boldijarre is working very hard to become the number 1 skin care company in the world. We at Sunrise Wellness Spa are very proud to bring Unity and district the finest of organic skin care that delivers results that the consumer is looking for. We have in house events with Christel who does the presentation and gives a wealth of knowledge. We have had a Pyjama Party, a Couples night as well as several other events. Watch for our advertising on these upcoming events offering door prizes and purchase deals. We thank Boldijarre for believing in rural communities and allowing his trainers to come to Unity to train us. Continue to share your winning smile where ever you go. Attend our 10th Anniversary Celebration having Eminence Organic Skin Care in Unity! Watch Facebook as we advertise daily and make time to stop in Thursday February 9th, Friday, February 10th and Saturday February 11th. To continue in Boldijarre’ s spirit we are donating $1.00 from each product sold to “UNITE for a Miracle, a local group organized to give back to Telemiracle so another family will get the help Jeremy and Cherie Wagner received 9 years ago. A way to Share the love. My Staff, Verlie Deuchar and Ellie Leidl are knowledgeable with the entire Eminence line in order to assist you. Spend time at the spa and enjoy the transformation.